This could be the start of something big. This year, as an idea for your Christmas dinner, I give you a partridge in a pear tree. 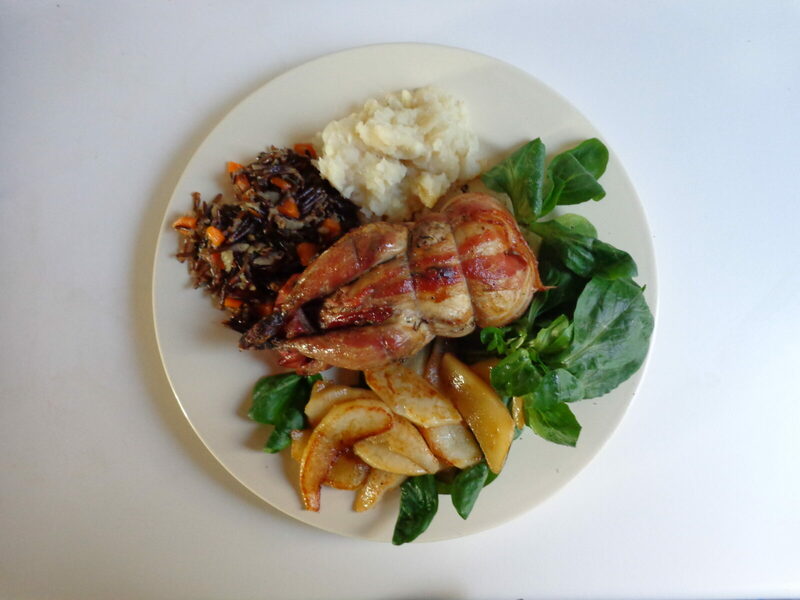 Well, to be more specific, roast partridge surrounded by succulent sautéed pear slices on a bed of greens, with wild rice and a purée of celeriac. Next year, it could be two turtle doves (roast pigeon), and the year after, three French hens (how appropriate!). But for the moment we’ll stick to partridge, my favorite game bird, less gamey than pheasant, more tender than wild duck. All of them readily available in France. Now, for the French foodies among you, why perdreaux and not perdrix? I asked at the market while buying the birds. It turns out that the former is a younger version of the latter — and hence more tender and less gamey. If you’d like to check while purchasing your partridges, ask for birds that are less than a year old. Next week I will be offering a spectacular holiday dessert. And in the meantime, I will be reading tonight from my new book, Desperate to Be a Housewife, at The Abbey Bookshop’s Christmas party. Do come along if you live in Paris. And if you miss it, there will be more readings coming up in January and February. Watch this space. And happy cooking! This entry was posted in 6. Poultry and tagged celeriac, celeriac purée, Christmas, partridge, pears, perdreaux, poires, purée de céleri rave, recipe, riz sauvage, wild rice. Bookmark the permalink. Thank you! And I must say I took a look at your site and found it very enticing as well. Bravo.